Magnetizing the weapon arms on a ForgeWorld Reaver Titan | 30mm Madness! After dropping the ridiculous amount of money for expertly cast resin parts from the UK… aka a VERY expensive pile of plastic… and spending weeks upon weeks of building and painting it, I don’t want to take it to my first game and regret my choice of hard mounted weapons! Sooo… I bought all the available Imperial weapons, and decided to magnetize the shoulders of the reaver and each of the weapon arms. 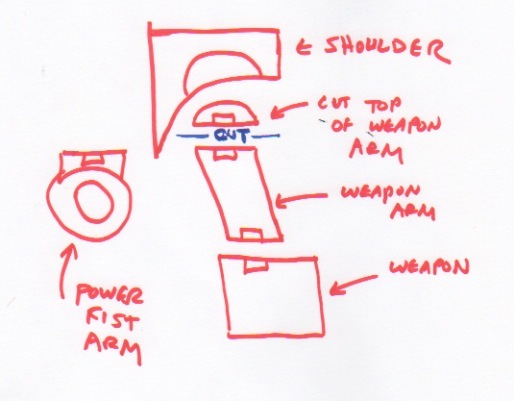 The challenge is that the Power Fist has a ‘flat’ interface to the shoulder socket where the other three arms have a ‘ball’ interface to the shoulder socket, so I had to essentially make the weapon/shoulder interface the same for all weapons. To do this, I made the ‘ball’ weapon interface ‘flat’ and used the cut tops of the arms to hold the magnet in exactly the right place in the shoulder. Hopefully this diagram explains (the square rectangles within the named parts are where the magnets sit). 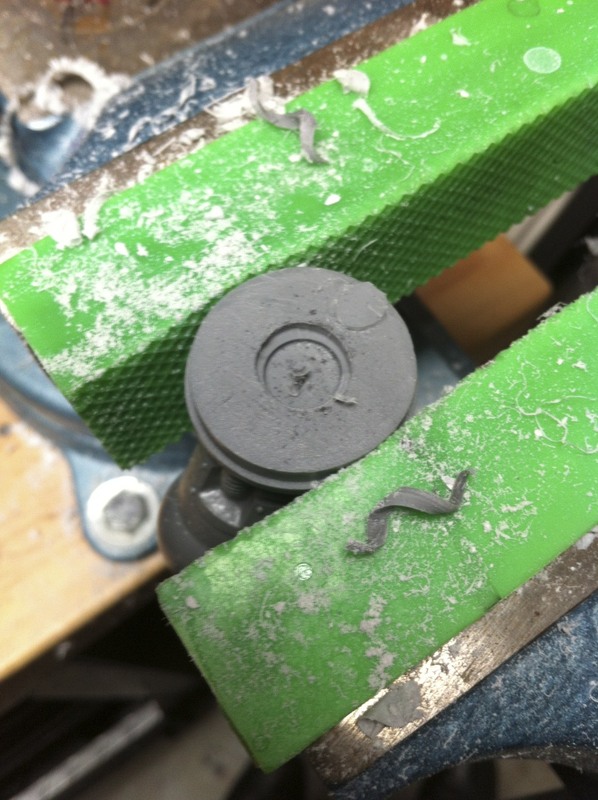 For magnets, I used SD84-IN 1/2″ x 1/4″ ‘stepped’ magnets from K&J. They have around a 10 pound pull force for this application so will be sturdy, but are ‘just’ weak enough to handle with fingers and no significant pinching danger. I don’t want wobbly barely secure arms! After testing the strength of them I’m very happy with the pull force. A mistake I made on other magnetization projects was to weigh the part being held on, and then get a magnet that is just slightly stronger. While this (barely) holds on the piece, it’s not sturdy at all and the piece falls off with just a bit of kinetic energy applied (e.g. you bump the model and the weapon falls of). 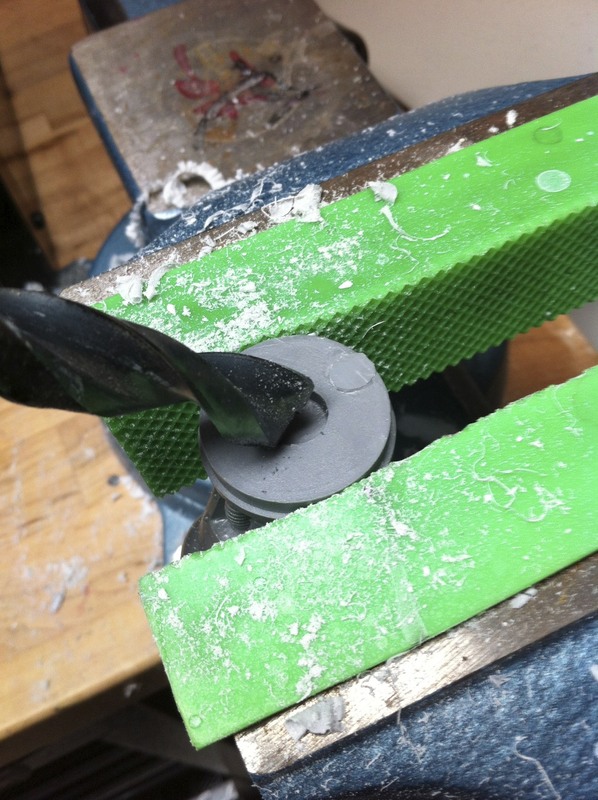 I went with the ‘stepped’ format so the epoxy has more to ‘grip on to’ when the magnet is glued in the hole. These magnets are rather strong, and I learned the hard way that if you ‘let them fly’ towards metal, that the nickel coating WILL chip off. Here I marked (the hardest part!) and cut off the top of a ‘ball interface’ weapon arm. The angle I cut the top off at ended up with arms that meant an ‘unlevel’ (from side to side, not front to back) weapon. If you want level weapons, make sure that the line you draw on the ‘ball’ of the arm socket is parallel with the ‘top’ or ‘shoulder’ end of the arm. In the picture below, to have level weapons, the blue line should be parallel with the ‘end’ of the arm on the right side of the picture… the ‘socket’ that is currently in the vice. Take a lot of time here, draw a line and place it in the shoulder socket and make sure it all lines up. You have PLENTY of space to work in the shoulder socket, as the power fist arm connects to the ‘outer’ ring of the socket, not the inner ring. If you see my pictures you’ll see a ‘groove’ immediately around the cut off ‘ball’ … I thought that the powerfist arm would connect with that…. I was actually testing the WRIST end of the powerfist arm, not SHOULDER end of the powerfist arm. Once I tested the SHOULDER end of the powerfist arm I realized that it mates up with the entire shoulder socket/outer rim, not the inner rim. If you test fit the SHOULDER END of the powerfist this will all make sense. Now that you’ve test fitted the pieces, you’ll see that you can/should cut off a pretty significant portion of the arm ball, giving your more room to create the parallel plane between the ends of the arm, and ending up with level weapons. To remedy my un-level weapon arm problem, I created a shim in one of the arms. This is less ideal than getting the angles correct in the first place.Below you can see my ‘fix’ and the parallel surfaces between the left and right ends of the arms. This weakens the joint a bit as it increases the distance between the magnets and puts one magnet at an angle (not ideal). I have three arms and will keep two of them ‘unlevel’ with the one below shimmed. 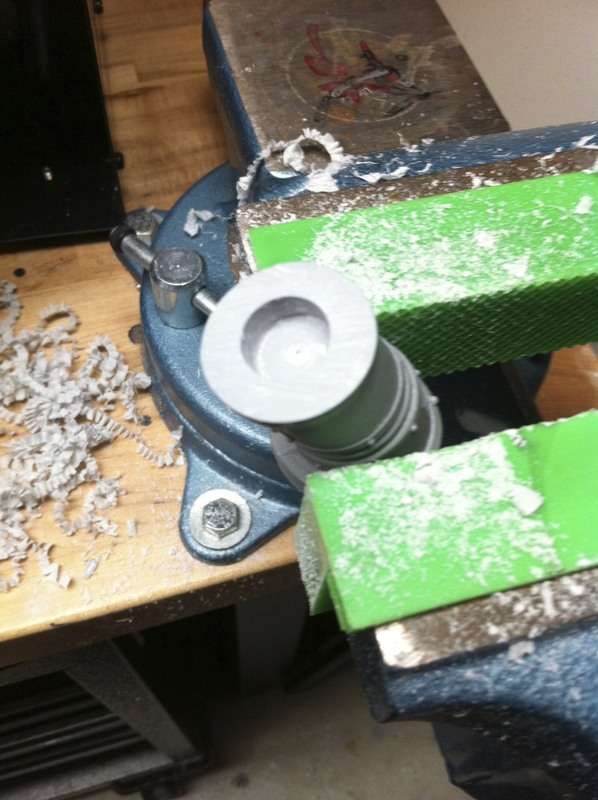 Then I drilled the magnet hole in the cut off ‘arm top’ using a 1/2″ forester bit (for a clean cut and flat bottom/good epoxy adhesion). Test fitted the ‘arm top’ and magnet in the shoulder socket. 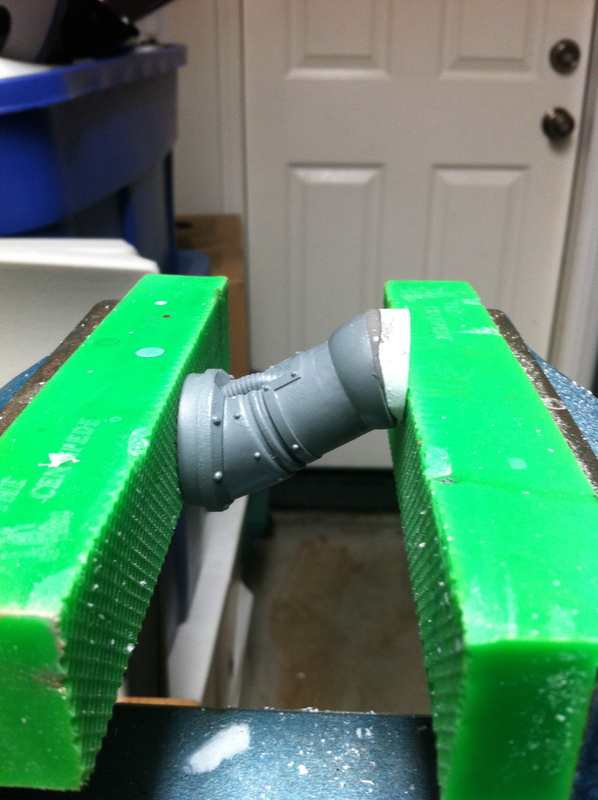 I then used JBWeld metal epoxy to glue all the magnets in place. Be VERY careful with polarity here, if you screw this up you’ve just ruined the part as the magnets are pretty much impossible to remove once the epoxy sets. Test and re-test, then test again. I made this mistake on another (thankfully smaller/cheaper) model before. 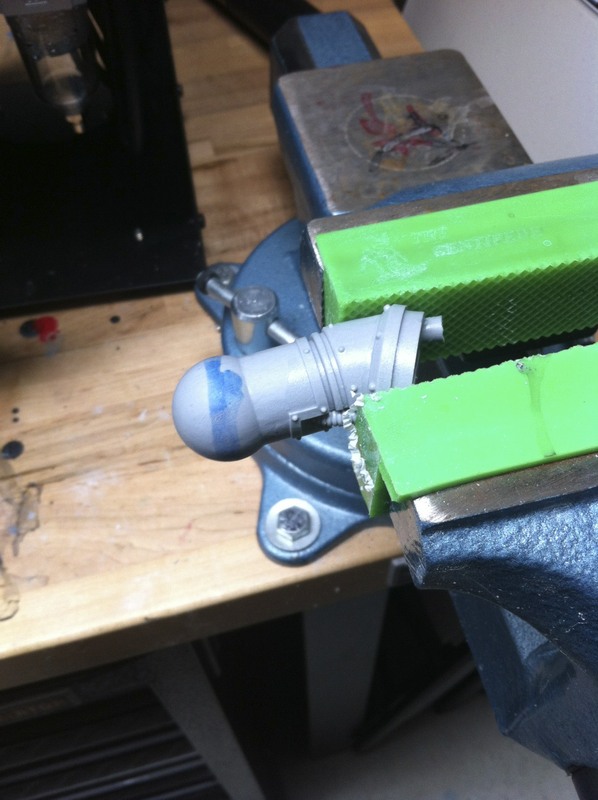 Oh…and test one more time before pulling out the glue. The next step is to wait. JBWeld is super strong but takes ~15 hours to fully cure. I did a strength test on bonded resin using a hammer vs. super glue/5 minute epoxy/JBWeld and JB Weld won…well, the hammer EVENTUALLY won, but JBWeld was the toughest, followed by 5 minute epoxy, followed by the CA glue. 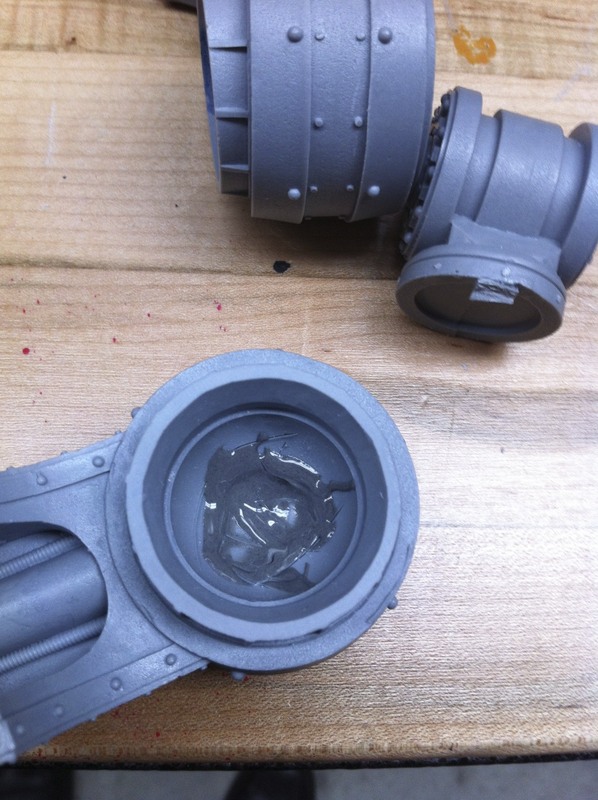 More pics of the weapon body magnetization in the near future. I ran out of magnets so have to finish this up in a few days when the rest of the magnets arrive. This entry was posted on January 13, 2012 by justinhardin. It was filed under Legio Titanicus, Modeling & Painting, Warhammer 40K . Pingback: Building the Reaver Titan PowerFist « 30mm Madness! Sure, what specific questions or information are you looking for? Hey, I just got a Mars pattern Warhound titan and have been looking for info on magnetizing titans in general (incidentally, your blog has been the first site I’ve found with some decent information on magnet sizes and placement). Do you think that the magnets you used here would be suitable for the arms on a Warhound? 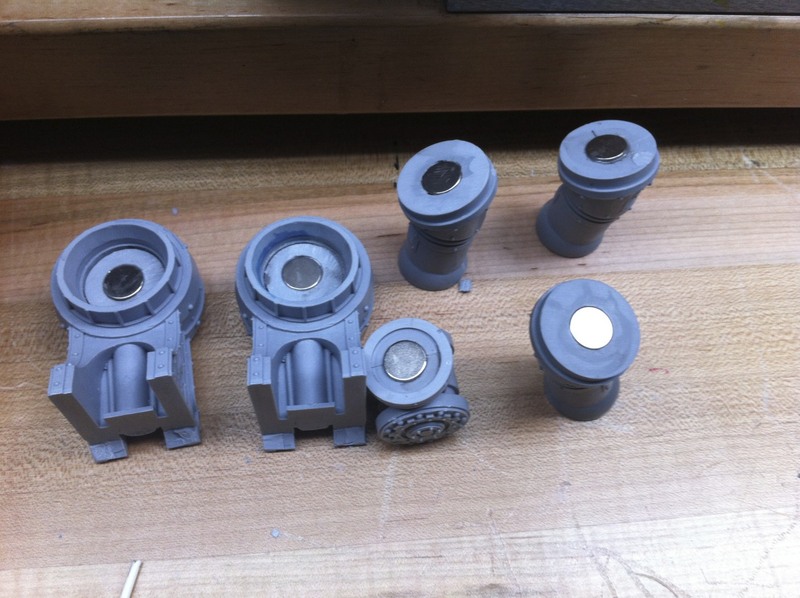 I ask because the arm piece (double ball-joint) seems to be only a little larger than 1/2″ in the middle section, which is where I was thinking about putting the magnets. 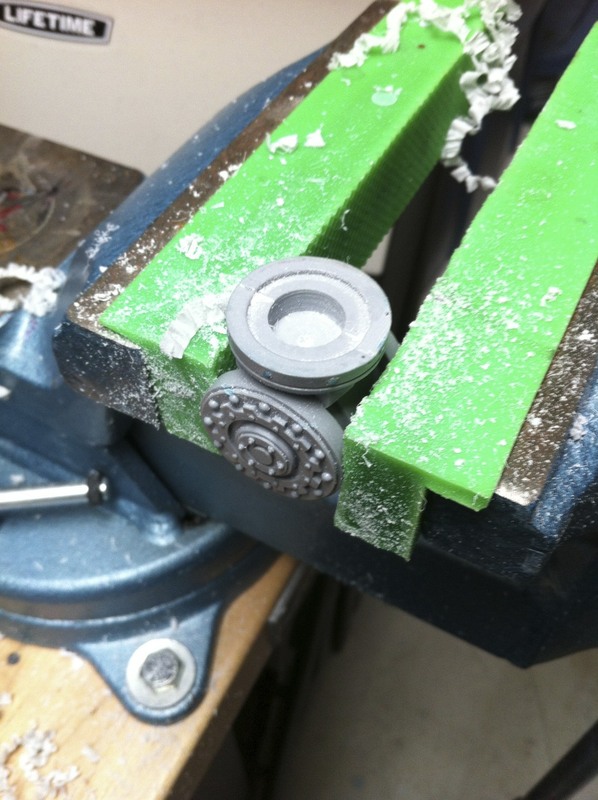 If you’ve magnetized one yourself, can you think of a place that would be better? If you’ve magnetized one yourself, can you think of a place that would be better? This is my first titan, so any other tips you would be willing to share would be greatly appreciated. Howdy. 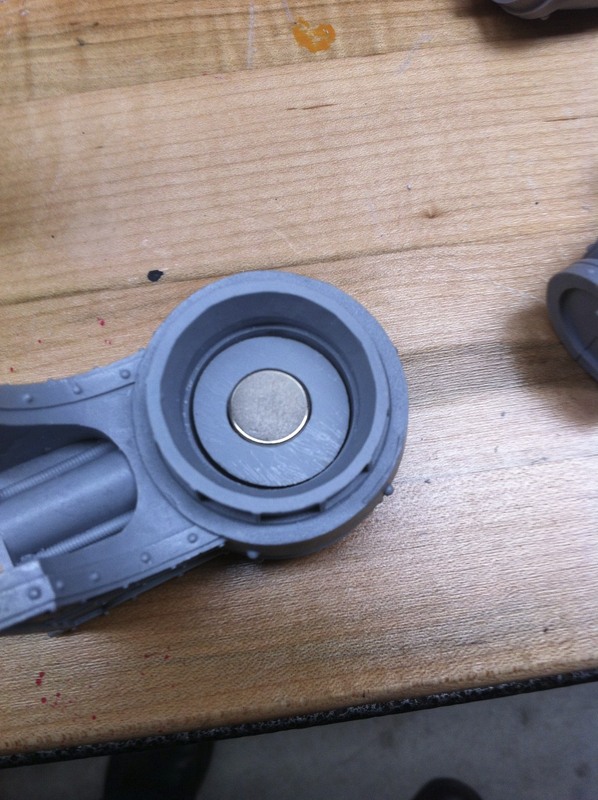 Yeah, I’ve magnetized a mars pattern warhound… Check out this post. I’ll snap a pic or two and send you recommended magnet sizing when I get a chance this weekend. That’s great, thanks! Awesome paint job, by the way. Really like the lighting effects, too. Hey, not wanting to harass or anything, but I haven’t received an email from you or seen a new post and just wanted to remind in case you had forgotten/got busy with all the holiday stuff happening. Doh! I did totally forget. Yes…crazy holidays. They are 1/2″… do fit in the warhound arms, and have the stepped disc shape that allows the epoxy to grip them better so they are less likely to pull out. 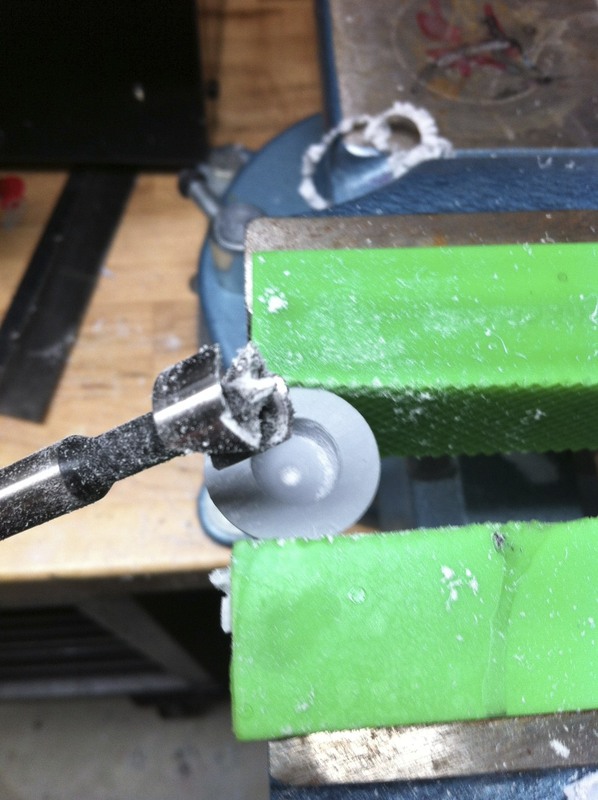 I use jb-weld, rough up the resin, drill a ‘relief hole’ so the extra JB-Weld can squirt out, and have never had problems with magnets pulling out after they are seated this way. I’ll hopefully have a chance to do a full ‘post’ confirming those are the magnets (pretty sure they are) and I’ll take measurements/pictures. Have fun on your Warhound build! Awesome, thanks for the info. Looking forward to the full post so I can compare notes as I work on mine.